Happy Valentine's Day, dolls! Valentine's Day means hearts and cupids, and since we're not that into naked babies with wings, our focus is on heart shaped everything! 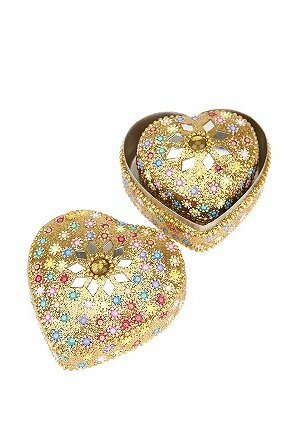 While hearts are representative of Valentine's Day, we think they're appropriate all year round, as they represent love and happiness. So this Valentine's Day, wear your heart on your sleeve... and ears, body, etc. Take a look! Carry your heart with you, along with your lipstick, cell phone, car keys, and maybe a tiny mascara. 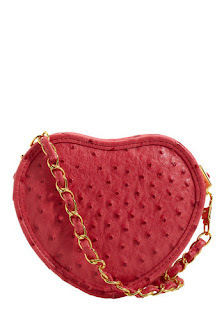 We love this heart shaped bag from Modcloth, which is a perfect compliment to any Valentine's Day ensemble. Wear it with a black dress, Mary Jane pumps, and a sweet smile for your sweetie. Another option is this sweet heart patterned clutch from Etsy seller blota. 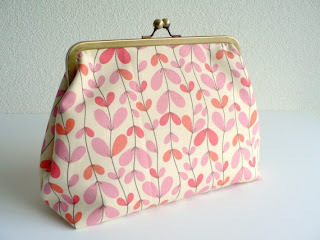 It can be used as a quirky clutch for a spring wedding or even as a very stylish cosmetics bag. We particularly love the inside lining of the bag, which makes it fun and fresh -- perfect for spring time! We love this elegant pressed heart necklace by Kathryn Cole. 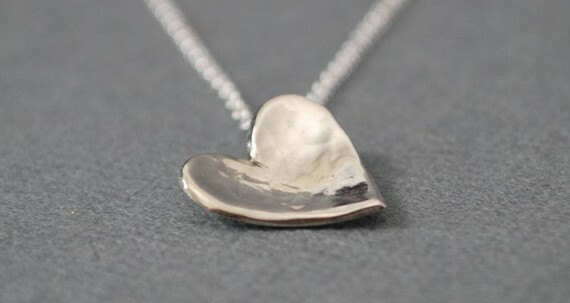 Made from sterling silver, the necklace is carved, hammered flat, and polished to give it a nice little sparkle. The necklace has a distressed but delicate quality, making it perfect for the urban girl. 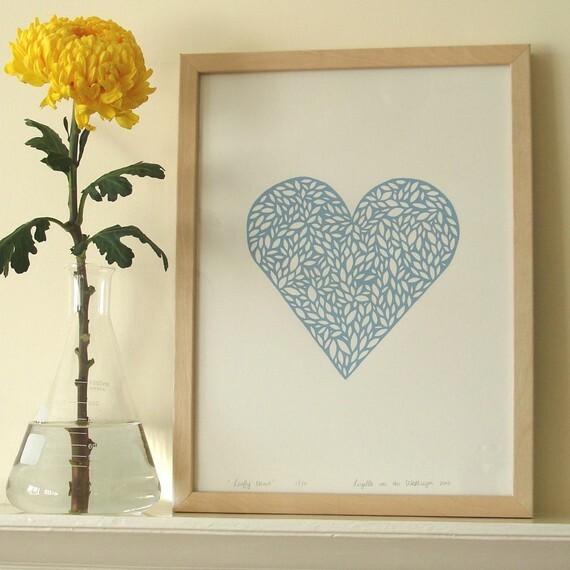 Decorate your home with this simple heart shaped screen print from mengseldesign. The design is handmade with tiny leaf detail, ensuring that your print will be one-of-a-kind. It's also available in pink, but if you're going for decor you may want to stick with the blue... otherwise your guy may end up vetoing the pink heart. are perfect for her. It'll add some glitz to her dressing table, plus it will be useful storage space for those delicate pieces of jewelry that always seem to get lost. 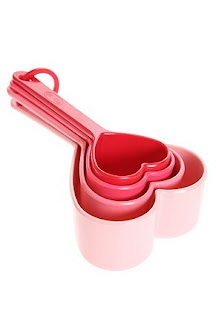 If your girl has a sweet tooth, then set her up with these heart shaped measuring cups. We suggest making it part of a larger gift bundle. Throw in a cute apron, some gourmet cupcake mix, and you can even throw in the matching measuring spoon set as well! Give the key to your heart this Valentine's Day with this gorgeous brass skeleton key necklace from our friends Gypsy Warrior. This is a perfect gift for a girl with laid back style who doesn't want too much fuss. 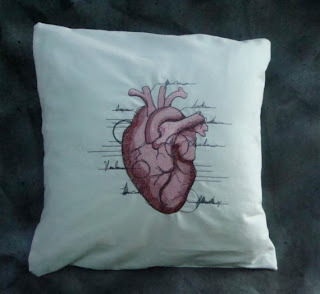 You're allowed to have a sense of humor, even on the most "Romantic Day of the Year," which is why we recommend this heart design pillow from tadaboutique. Sure, it may be taking the heart theme a little too literally, but that's the charm of it! This way, your lady can cuddle up with your heart any day of the week. 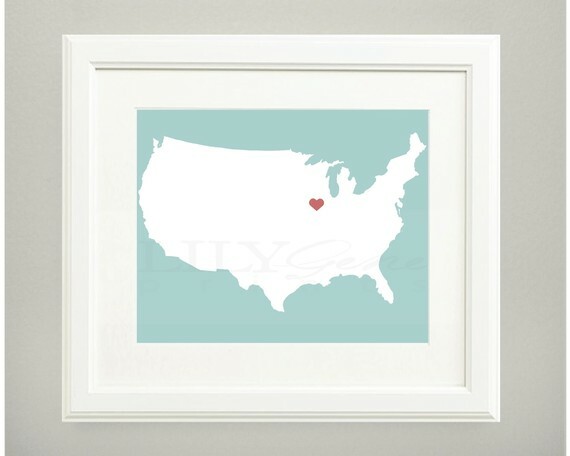 Show your sweetie where your heart resides with this customizable print from Lily Gene. It's a very touching way of putting your love "on the map" (so to speak), and you can customize it by choosing your country, state, etc. and by selecting your own color scheme to match her home decor. I thought the same thing Maggie!!! So cute but a little pricey!